Download yvSmiley: JoomlaCode, local file (unzip before install). For "Joomla! 1.5" please download yvSmileyPlugin v.1. package, the latest one is v.1.03.001. It may show smileys in your Articles (working as content plugin), on the whole page (so, you will have smileys everywhere), or it may be used by any Joomla! extension (as an example, it is integrated into my yvComment extension already). yvSmiley ships with two ready to use "Smiley sets" (from TinyMCE and phpBB), that you may customize, and it also supports aMSN (Alvaro's Messenger) skins, so you may choose from many existing "Smiley sets", that are part of these skins, and use them without any modification (download the skins from http://www.amsn-project.net/skins.php). yvSmiley is written from scratch specifically for Joomla! 1.5, and it is not compatible with previous versions of Joomla!/Mambo. So it is free to use most advanced features of Joomla! 1.5. ...Smileys are means of nonverbal online communication . 1. To install yvSmiley, you MUST have at least Joomla! 1.5 build 8688 (RC2 dated 2007-08-31) or newer (see the tip). yvSmiley is a "system plugin". In a case of any problem, please refer to the Troubleshooting section below. "Smiley set" is a group of smileys (images, e.g. ), their codes (e.g. ;-) ) and their descriptions (e.g. "Wink"). More, than one code may have the same smiley (e.g. ;-) and ;) ). 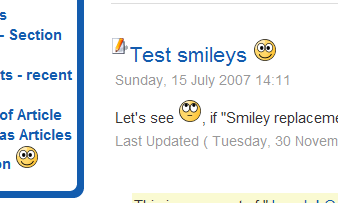 But when yvSmiley lists all smileys (presents clickable table of smileys), it shows only first code for each smiley. "Smiley sets" are stored in text files, so it is very easy to customize them and exchange them. Of cause, "Smiley set" file doesn't contain smileys themselfs: it contains URLs (file names) of smiley images. - as you may see, there is SMILEYS_WINK 'language constant' in this line, so description of the smiley may be translated (localized). aMSN skin format. aMSN is Alvaro's Messenger, which has rich support of skins and those skins (unlike Joomla! templates before yvSmiley ) contain "Smiley sets". You may use either aMSN default smiley set (see picture below) or Smiley set from any custom skin, that you may freely download from http://www.amsn-project.net/skins.php. All configuration setting of this extension are set in "yvSmiley Plugin parameters" (Administrator interface->Extensions->gin Manager->yvsmiley). 'TinyMCE sample set', that is stored in the file '/plugins/system/yvsmiley/smileyset_tinymce.csv'. Custom "Smiley set" file in aMSN skin format. For the last two options you have to fill 'Path to the Custom 'Smiley set' file' parameter, typing path, relative from the site root (starting with '/') or full path. It is recommended (or in the case of to 'aMSN skin format' required) to use relative path, so URLs of images, stored in the 'Smiley set' file, may be relative also. Of cause, you may create your own folder for smileys, e.g. '/templates/smileys/' and put your custom 'Smiley set' files there. 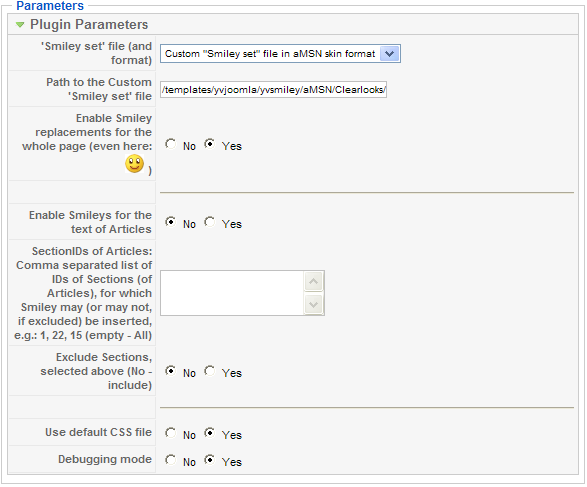 Eextracted its default skin (whole folder "skins/default" with subfolders) to my templates folder "/templates/yvjoomla/yvsmiley/aMSN"
In yvSmiley plugin parameters set "'Smiley set' file (and format)"= "Custom "Smiley set" file in aMSN skin format"
yvSmiley may show smileys in your Articles (working as content plugin). This option ('Enable Smileys for the text of Articles') is disabled by default, but you may decide to enable it (change to 'Yes'). You may restrict work of this plugin for Articles, that belong to only some Sections. To do this, type comma (,) separated list of IDs of Sections in the "SectionIDs of Articles" parameter. Leave the field blank to allow replacement of smiley codes with smileys (images) for Articles of any Section. Additional parameter: "Exclude Sections, selected above (No - include)" helps you to make this list shorter. If you don't want to have Smileys for only a small number of Sections: set this parameter to "Yes" (i.e. "exclude"), and type (in the "SectionIDs of Articles" parameter) only IDs of Sections to be excluded. - as you may see, yvSmiley changed this Article just like it changed comments on the examples above. 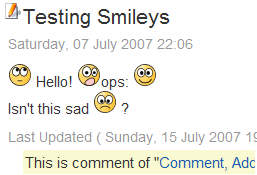 So, there is a reason to 'Enable Smileys for the text of Articles' at least for the Section, where Comments live . yvSmiley can make Smiley replacements for the whole page ("Enable Smiley replacements for the whole page" option). Thanks to louis.landry for this idea! As you can see on the picture above, you may have smileys everywhere on the page: in the menu items, in the titles of Articles etc.)! So you may have smileys even in those extensions, that know nothing about yvSmiley. By default, yvSmiley uses simple CSS file (/plugins/system/yvsmiley/default.css), that is intended to be used as a start point for customization. If you made your customized css in your template, your have to change setting of "Use default CSS file" parameter to "No". Currently yvSmiley is translated into these languages: German, English, French, Polish, Russian, Turkish. If you have any problem, please start from reading this page from the very top - it is exactly for this purpose: to make your questions answered and problems solved. Current version of yvSmiley requires Joomla! 1.5 build 8688 or newer (higher build number). Moreover, it definitely doesn't work on older builds of Joomla! 1.5. yvSmiley was successfully tested on Joomla! 1.5 build=8843. So, if you have some problem, start with moving to the newest build of Joomla. If you still have problem, please read messages in this Joomla! forum. Maybe, your questions are answered already. - and send it to the above mentioned forum: it is the best place to get answers. If you want to discuss yvSmiley with Joomla! community, please go to the Joomla! forum. Please refer to the "Future plans and thoughts" section below before posting Your suggestions. If you want to write your review of yvSmiley or to read other user's reviews, please go to the Joomla! Extensions Directory. Please, help others to improve nonverbal communication using Smileys ! If you found a bug in yvSmiley, or even developed a fix for it; if you created new translation or updated existing one - please, send them to the author! All translations were removed from main yvSmiley packages. Now yvSmiley Plugin package contain English language files only. All 4 translations were moved to 4 yvSmileyLanguagePacks, that may be downloaded from JoomlaCode and installed separately. There is also special, 'English language pack', that is template package to be used by translators to create additional language packs for yvSmiley extension. For information, why this was done, please see the discussion in the forum: How to create language pack for Joomla! 1.5 extension. 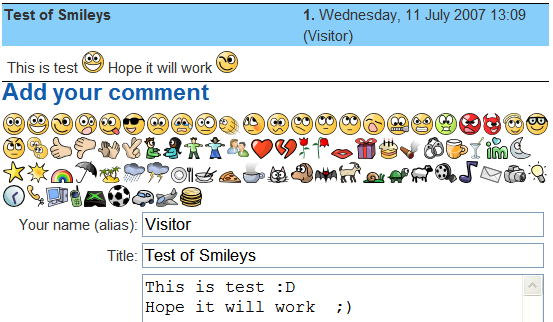 yvSmiley's interface was extended: the third optional parameter: '$id_of_smiley_form', - was added to the onSmiley_RenderForm. When this parameter is not empty, yvSmiley adds 'id' attribute to the generated 'div', and so the div with smileys may be accessed through script (e.g. to hide or show smileys). Code refactored to better avoid "forbidden" places, when replacing smiley's code on the whole page. Error handling improved, including smart recovery from wrong 'Smiley set' files. Added translation: German (Thanks to RePa). Fixed to work with Joomla! 1.5 RC2. Got rig of old ways to do things... so now yvSmiley is not compatible with Joomla! 1.5 builds < 8688 (before RC2). yvSmiley is written from scratch specifically for Joomla! 1.5 and it is not compatible with previous versions of Joomla!/Mambo. So it is free to use most advanced features of Joomla! 1.5. My intention is to build extension, that is as much "natural" to Joomla, and that uses as much built-in features, as possible. To use yvSmiley, other extensions don't need to refer to it in any way: they just trigger events, that are intercepted by yvSmiley (if its installed and enabled). If yvSmiley is not installed or is disabled, this doesn't lead to any errors! As you may see, it is VERY easy to use yvSmiley in other extensions. Optionally, (this is configurable) yvSmiley registers itself to the 'onPrepareContent' event, and so it acts as ordinary "Content" plugin, replacing (in $article->text property) smiley codes with corresponding images. You may see example of yvSmiley usage in the yvComment extension. GPL. Freeware, i.e. at no cost. If you like this extension, please consider donating. The Joomla! extension is distributed "as is", without any warranties explicit or implied.